"Should I just throw this away?" Or maybe, instead, you could put many hours and probably more money than a new case would have cost into that bad boy, transforming it from a beige horror into a joy to behold. Your friends will think you're nuts. The other guys on OCN will be overcome by waves of nostalgia washing outward from your mod log. You roll up your sleeves and get to work. That's right. It's one thing to take a modern, well-designed case and tweak it to make it a personalized, customized work of wonder. It's quite another to take a case with the PSU in the wrong place, nowhere to mount front fans, drive cages in the wrong place, and no place for cable management, and turn it into a work of art. Beigemodding - Stories, mod logs, and how-to's to take a beige box from trash to treasure. Sharing tips and tricks that are specific to many beige case mods. Other Budgetmodding - Taking other low-end cases and Improving them with everyday materials. We'll talk about inexpensive substitutes for more expensive modding materials. Cheap alternatives to expensive special-purpose supplies. What kinds of things are we not focused on? We're not so much into store-bought custom hardware. We've seen some fantastic looking cases done that way, but we're interested in using everyday materials (as much as possible) in mods. We want modding to be as easy as running to the neighborhood hardware store and to come from your own hard work. We're not focused on pro-level thousand-dollar mods. 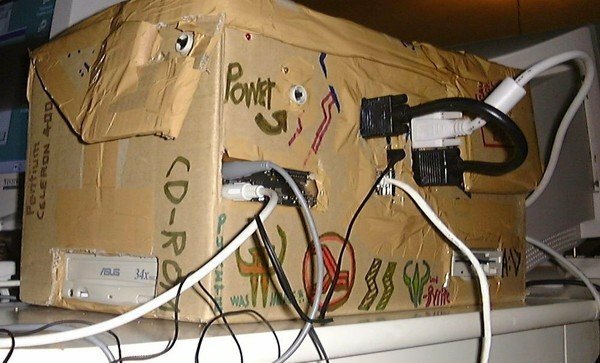 We've all seen some incredible work by professional and semi-pro modders. But we are more interested in what can be done on limited budgets. We're not going to spend a lot of time talking about special-ordering finished components and outsourcing large portions of our builds. Again, there are some third-party case modding companies and CNC milling vendors out there that can redo an entire case to your design. But that's not what we're about. Now, if you send a custom logo off to be engraved or milled, that's fine, but that sort of work shouldn't be the majority of the mod. Ghetto-modding. 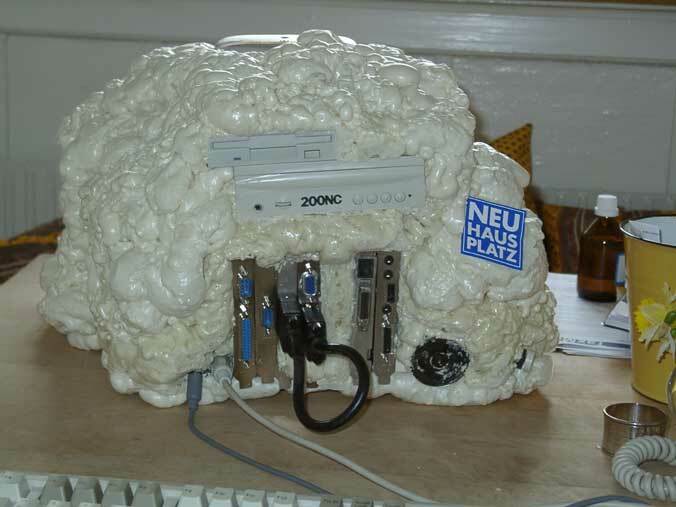 While we are focused on modding on a budget, we're not talking about, for example, encasing your computer in expanding foam like this guy, or in a cardboard box like this guy. We are looking for folks who want to take pride in their work. For Beigemodders, all you have to do is have a beigemod starting, in-progress or completed. For non-beige budgetmodders, we'd like to first see your mod log and what your plans are for the mod, to ensure it meets our focus. Once you have joined, copy and paste the following into your signature so we can help spread the Love of Rehabilitated Beige throughout the cosmos! trevorludgate and FloofyFox - Beige Case Modding Competition! 1) Where Can I Find A Beige Box and How Much Should I Pay? 2) What features should I look for or avoid when evaluating a beige case? 3) What Tools Do I Need? This six-month effort combined not one, but TWO beige-like computer cases into a single entity! The bottom case in the upper photo was cut in half and turned into a cooling box, while the upper became the main system. Modifications included custom 3D printed parts, completely retooled interior, custom foam panels, custom water loop, awesome custom paint scheme and decal work, and the list just keeps going on and on! He even used a small automotive radiator! This case came in second place in a Mod of the Month competition on another site! For details on means and methods, visit his mod log! This seven-month effort was an attempt to take a relic of a beige box and turn it into a thing of beauty. Highlights of the build include: hand-sculpted front bezel, custom paint job, custom window, flipped mobo, paracord sleeving, scratch-built cable management panels, scratch-built PSU shield, hand-made backlit logo, rotated and vented drive cage, and 120mm fan holes throughout. Jhereg10 used locally available materials as much as possible including PVC pipe, body filler, foam board, and salvaged materials from the original case. Most of the internal system components were purchased from the OCN members through the Marketplace. For details on means and methods, visit his mod log! repo_man completed this build way back in 2008, but the final product is timeless! From the dual jet intake front fans, to the duel rear exhaust fans, this thing has serious airflow and serious looks. Add to that the clean interior and a custom 90 degree HDD mod in the 5.25" drive bay, and you just can't go wrong. And then there's the cable management. Those old PSUs and cases weren't easy to get that clean look from, but he did it. Well done sir. Well done indeed. For details on means and methods, visit his mod log! BruceB's 20€ LAN PC - COMPLETE - June 2014 MOTM NOMINEE! BruceB took an ugly beige box, so ugly we used it as our example on the first post, and took it all the way to the top. Including but not limited to cutting it down to about 75% of its original size, a custom paint job, home-made LED light strip, vinyl wrapping the PSU and GPU backplate, and custom window mod, this mod epitomizes what a quality beigemod can be. For details on means and methods, visit his mod log! XIP28's PC started out its life as a bland, cookie cutter, office box. But no longer! He tackled that most dreaded of beigeboxes, the U-Shaped Shell From Hades, and bent it (no pun in tended) to his will. A snazzy new paintjob, a surface-mounted plate with backlighting on one side panel, and some excellent windows on the other and he was in business. This is one box that's not ashamed to proclaim its 486-ish-ness! For details on means and methods, visit his mod log! XAslanX made a marvelous tribute to Syrillian using a smoke and dust-filled beige box he found at a thrift store. He cleaned it out, disassembled it, cut new fan holes, and gave it a gorgeous paint job with intricate stencil work. After rounding it out with some more modern internals, he breathed new life into that case. For details on means and methods, visit his mod log! "M11x R2 Black OPS II Edition"
Anyhow looking forward to sharing and seeing where this goes! And this one wasn't beige but was a crummy old case. To watch the whole mode click. Glad to see you're interested @MCCSolutions! I've just posted a link in my build log, maybe we'll get some other members soon! I took the .5 GhZ challenge! In so in this I am a Budgetmodding expert!! Great to have you! I've heard stories about some of your clever repurposings of components! Excellent. That's exactly the kind of mod we want to showcase. I'll add it to the showcase thread later. Good to have you following us! Can't wait to see it, man. I'm impressed by how it started out!